A couple hundred million bucks will buy a lot of cool special effects, something the new sci-fi actioner Pacific Rim proves in spades. The tech looks cool, with gigantic, battle-worn Jaegers towering over everything. Jaegers are supersized robots, as tall as skyscrapers, designed as humankind’s only defense against the kaiju, alien lizard monsters that emerge from an interdimensional rift deep in the Pacific Ocean. Director Guillermo del Toro stages enjoyable smackdowns, mostly in or under water and nearly exclusively at night. But without compelling plot turns, memorable dialogue, or anything remotely approaching relatable emotion, the impressive visuals are pretty much wasted. 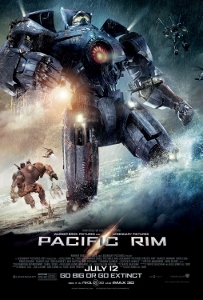 It’s almost as if del Toro and a team of producers got together and said, “If we steal plot elements from half a dozen movies, sketch out a few predictable plot points, and create some cardboard characters, can we still have a hit?” In a way, Pacific Rim is the most cynically mechanical movie I’ve seen in a very long time. Emotional connection, even at the most basic level, was sacrificed in favor of F/X. At times, its gung-ho, rah-rah mentality recalls Paul Verhoeven’s Starship Troopers, but without any of the subtext and precious little of the humor. Travis Beacham’s screenplay (co-credited with del Toro) eschews nuance altogether, adopting a “point A to point B” style that makes the film’s 132 minutes seem like a chore. I kept expecting a killer twist to flip things around, but honestly this is just robots versus aliens, locked in a battle to save planet Earth. 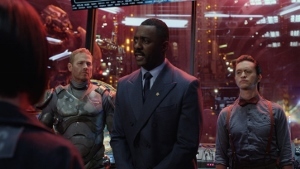 Stacker Pentecost (Idris Elba) leads the Jaegers, presiding over the teams of two who control the behemoths. Raleigh Becket (Charlie Hunnam) was an ace Jaeger pilot. The film opens with a flashback that shows us how he and his brother Yancy (Diego Klattenhoff) were “drift-compatible” but finally met their match after a particularly vicious kaiju ripped open their robot and killed Yancy. The “drift” is a mind-meld (yes, they use that term) between two Jaeger pilots that allows them to experience each other’s thoughts in order to work together more efficiently. Compatibility means being able to handle the intense rush of living someone else’s memories, and being able to distinguish them from real life. Raleigh retreated to civilian life after surviving the attack that claimed his brother’s life, working as part of a construction crew building a ridiculous wall meant to keep kaiju out of coastal cities. 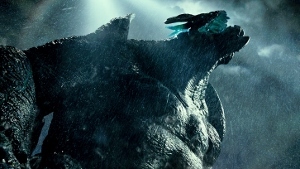 Pentecost reinstates Raleigh, pairing him with Mako Mori (Rinko Kikuchi) and tasking them with piloting a nuclear-powered Jaeger directly into the rift. The ultimate goal (of course) is to nuke the portal in order to seal it and keep the alien invaders out (what an ingenious plan, loved it in The Avengers last year). To be fair, Charlie Day and Burn Gorman add a very welcome touch of wacky humor to the otherwise overly earnest proceedings. They play Dr. Geizler (Day) and Dr. Gottlieb (Gorman), a constantly bickering team of scientists. Geizler wants to “drift” with a partial kaiju brain that he’s kept alive in a tank, despite everyone’s warnings that it might kill him. Gottlieb is convinced that the secrets of the kaiju can be cracked by crunching numbers. Day and Gorman have a blast playing these eccentrics and a cameo by Ron Perlman only adds to the sense that Pacific Rim should’ve been much more fun. The leads simply don’t have the star power needed to really power this clunker. The whole thing ends up feeling like the greatest video game you’ve ever watched someone else play.